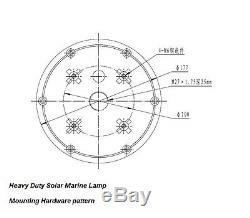 Solar Warning Lamp - Solar Marine Dock, Channel or Hazard Marker. Bright RED LEDs - 360 degree pattern. FAST FLASH ONLY - 2 times every 2 seconds. 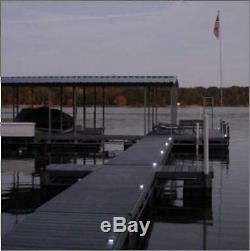 Solar re-charging automatic dock lighting provides 360 degrees of lighting; Ideal for identifying docks, navigation aides or obstructions at night. Turns on automatically at dusk; Flashes 2 times every 2 seconds. Extra Large, Heavy Duty LED - Large Solar Panel and 4400mAH rechargeable battery. Heavy duty clear ABS plastic case - fully waterproof and weatherproof (IP65). Undermount Style - Heavy duty mounting base for secure installation - hardware included. Center-mount threaded base for elevated installation. A bright fully automatic re-chargeable navigation and dock identification light. 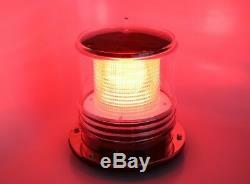 Also available in WHITE and GREEN LED version - see our other listings (other colors = special order). Marine hazard or channel buoys. 18 Super-bright LEDs, 360 degree pattern. 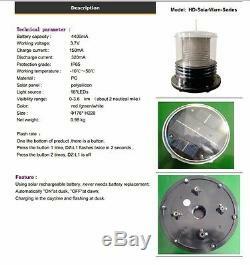 Internal NiMH rechargeable battery (replaceable / normal working time 1.5 years). Fully waterproof and vibration resistant. Operating time: 10 to 14 hours. Visible range: up to 2 miles. 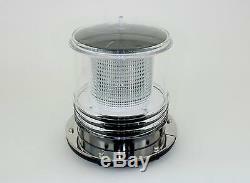 Size: 8.25" height x 6.4" lamp diameter (6.9 diameter at base). RED LEDs behind a Clear Lens. Flashing mode: Twice every 2 seconds (30/minute) - this model does not have a Constant On mode. Ships fast from our Long Beach, CA warehouse. 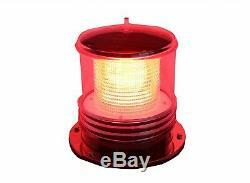 The item "Marine Solar Warning Light RED LED Marine Dock Barge Safety Beacon Light" is in sale since Tuesday, October 10, 2017. 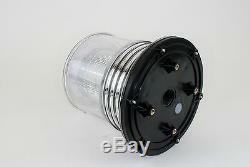 This item is in the category "eBay Motors\Parts & Accessories\Boat Parts\Anchoring, Docking". The seller is "britta_products" and is located in Long Beach, California. This item can be shipped worldwide.